Your email address will not be provided to others under any circumstances. You may be wondering: what exactly does an architect do? We are frequently approached by people who have never worked with an architect. 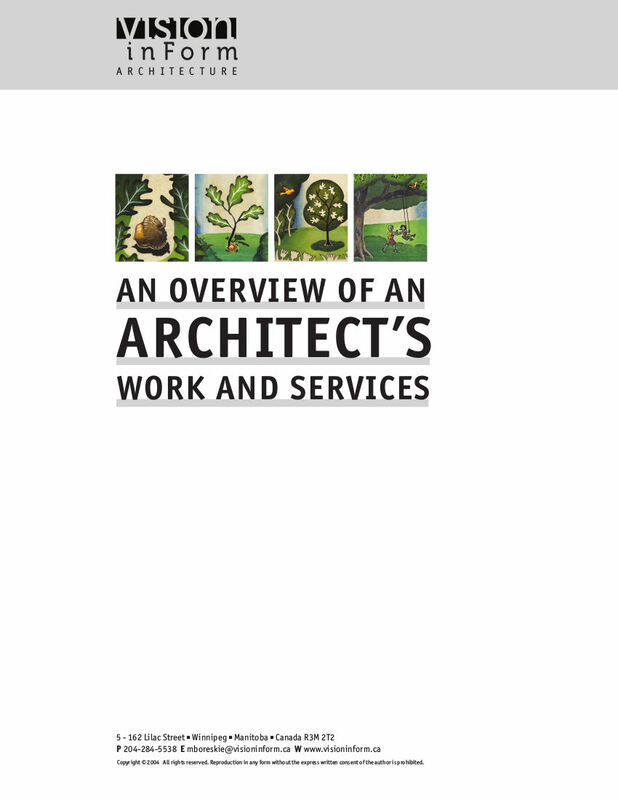 We prepared this guide after hearing from many of them they were not sure of what an architect does. a more detailed charting of sample activities for each project phase of a typical project. You may be wondering: how do I find the right architect for our project? Architectural firms come in a wide variety of sizes and types. Some firms have a very narrow scope of interest while others are generalists. Each brings a different combination of expertise, specialties and values. Finding your perfect match in an architect is not impossible. In this informative downloadable PDF guide you’ll discover how to do so. Use its 20 step Architect Selection Checklist and Schedule to organize your process, and an Architect Interviews Weighted Score Sheet, covering 31 key issues for evaluation in eight different categories, to assess architects who are interested in working with you. 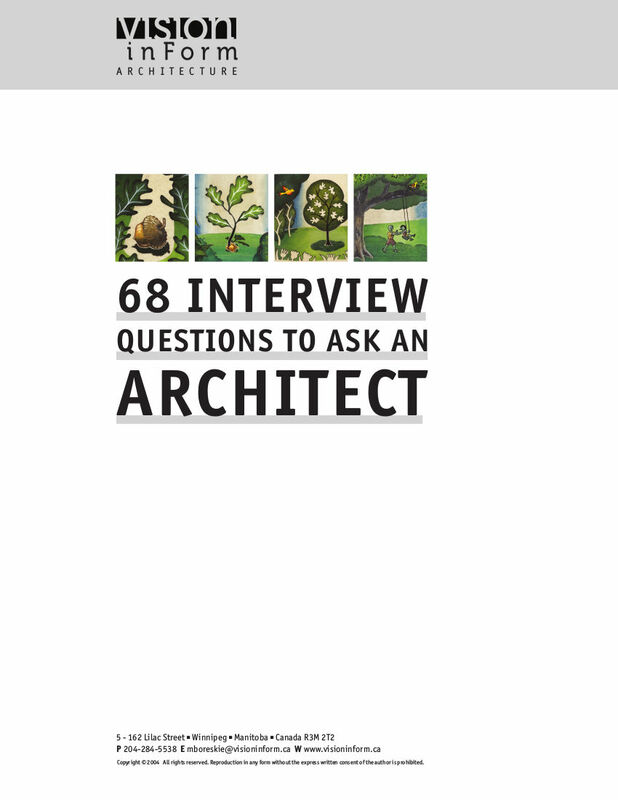 You may be wondering: what questions should I ask an architect to see if we are a good fit? Each project has its own unique characteristics. In this informative downloadable PDF guide you’ll find 68 questions, covering nine categories of information, that form a resource to help you construct questions that respond to your project’s unique characteristics. 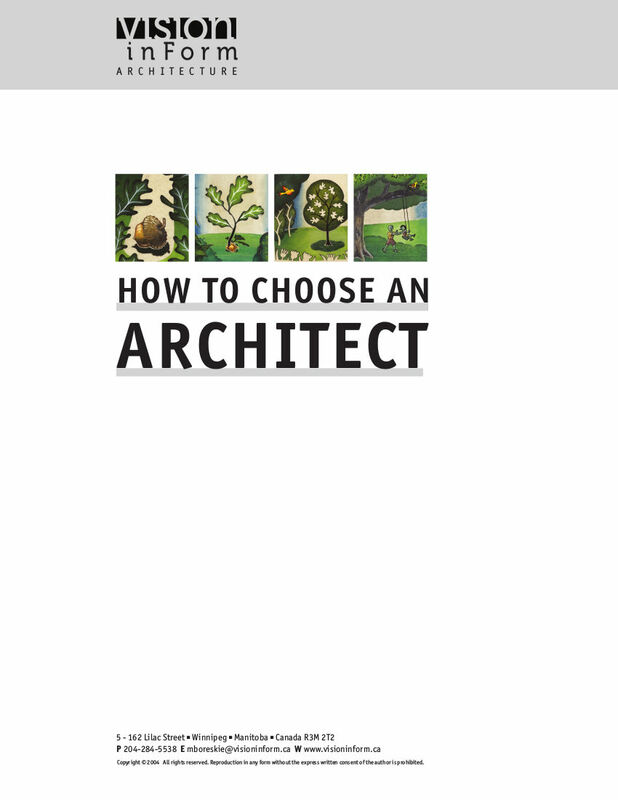 This guide works as a useful supplement to our guide: HOW TO CHOOSE AN ARCHITECT. It is basically impossible to live in the world today without being aware that global climate is in a state of dramatic change – or, as one speaker describes it – disruption. It is equally impossible to be unaware of the cataclysmic outcome that we will visit upon ourselves if we fail to develop at least a proportionate response. If we are to come to terms with these realities, our current way of being must change. We have to move beyond our own physical backyards, both literally and figuratively. WHY BOTHER WITH ARCHITECTURE? – RENEWING HUMAN ENERGY IN THE MIDST OF CLIMATE CHANGE provides the perspective we take at Vision in Form, our sense of the currently much-ignored power of architecture and of its capacity to create health and hope in the face of difficult local and global challenges. We hope you enjoy it and look forward to your feedback on the contents. I remember, as a six year old child, building extensive toy roadways and towns under the apple trees in my parents’ prairie-town backyard. Clearly, a seed of interest in the built-environment had taken hold. In the intervening years this early interest has grown into a deep fascination with why and how we are able to create appropriate spirit of place for owners that nurtures and enlarges the lives of people who come in contact with it. 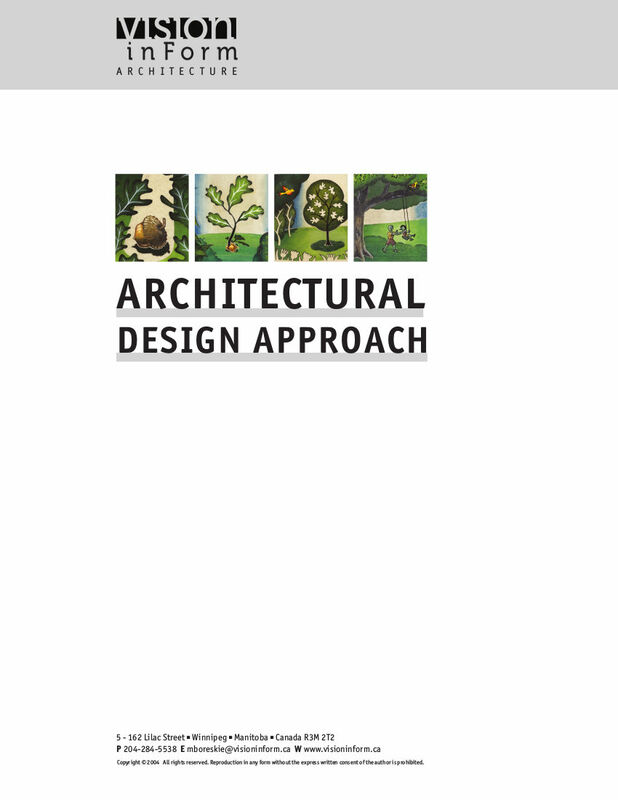 This guide highlights key elements of our approach to the architectural design of place. A great debt and thanks is owed to many individuals whose work has shaped our perspective and endeavors at Vision in Form Architecture. First among these is the philosopher-theologian, economist and student of methodology, Bernard Lonergan, S.J., followed by Robert M. Doran, S.J., David Creamer, S.J. and Rev. Terry J. Tekippe who have worked to promote and expand Lonergan’s thought. With regard to the topic of climate disruption, I am indebted to, among others: Naomi Klien, writer, political analyst and critic of government; political scientist William Barnes and intellectual historian Nils Gilman; the work of the Intergovernmental Panel on Climate Change; and comments offered to the media by Laurent Fabius, Foreign Minister of France, and Matteo Renzi, Prime Minister of Italy. The thought of individuals such as Charles Taylor, known for his contributions to political philosophy, the philosophy of social science, history of philosophy and intellectual history, author and essayist John Ralston Saul, cultural historian Richard Tarnas, philosopher of mind and of art Suzanne K. Langer, and psychotherapists Carl Jung and Ira Progoff have been of great assistance. Finally, the work and thought of architects such as Louis Kahn, Frank Gehry, Juhani Pallasmaa, Alberto Perez-Gomez, Alvaro Siza Vieria, and Paul Brislin have offered support and incentive. 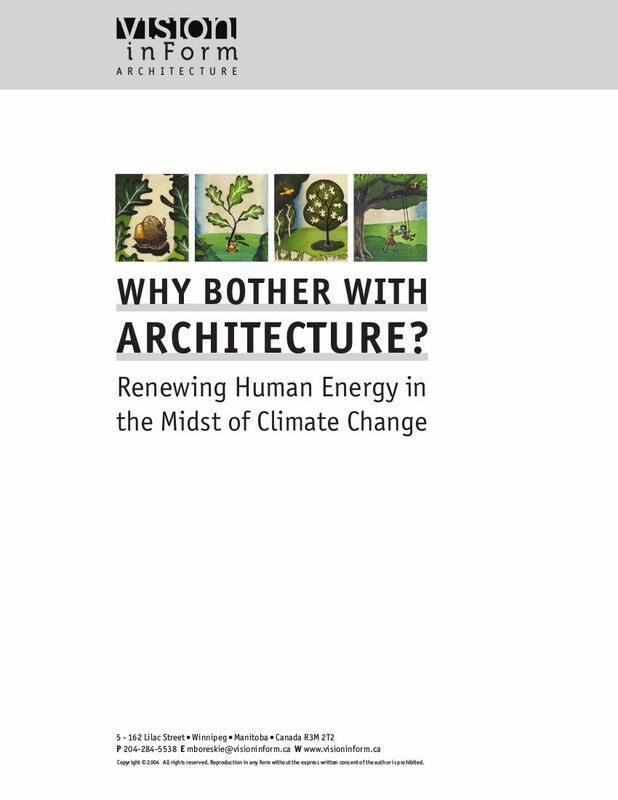 Quotations from the writing and commentary of many of these individuals can be found in the Download entitled: Why Bother with Architecture – Renewing Human Energy in the Midst of Climate Change.